The Martin Green (US No. 90018) was the second tug built for Oliver B. 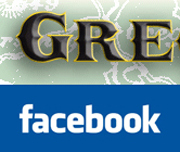 Green by shipbuilder John Gregory. She was launched on 12 June 1869 and not much is known about her specs except that she weighed 19 tons and was named after Mr. Green’s son, Samuel Martin Green. She was valued at $6,000 in 1871. Rebuilt in 1878. The Chicago City Council made it unlawful for bridges to be open during the morning (6:00 AM – 7:00 AM) and evening (5:30 PM – 6:30 PM) rush hours. At precisely 7 o’clock on the morning of 10 July 1880, the tug Martin Green under the command of Capt. William J. Connors, towed the scow Mocking Bird (US No. 90744) into the Clark street bridge with such force as to sweep the levers out of the tenders hands, all three of whom happened to be on duty, and seriously injured one of them, William Johnson. The scow lost her jibboon. According to the foreman of the bridge, the tenders had the bridge open to let vessels through for eleven minutes. At that time they hoisted the red ball to get a large number of waiting people an opportunity to cross to get to their place of work. 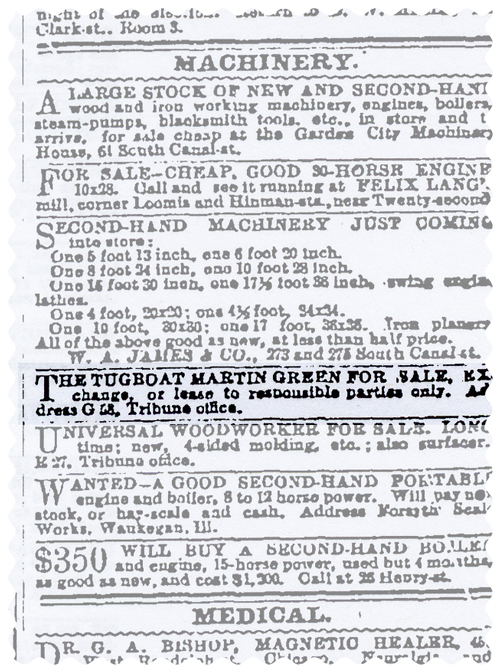 The Martin Green at the time was between Rush and State streets, and coming up with his vessel. She whistled at the bridge, but the ball was up to let people and teams pass. Instead of coming along side of the vessel, the tug kept ahead of her and steamed directly for the bridge. About four minutes passed from the time the bridge was first signaled and the near approach of the tug. The foreman than sounded the bell when he noticed that the Captain meant some mischief. With a bridge full of people and teams, several minutes are needed before the bridge can be cleared and swung. The tenders were forced to swing the bridge sooner than planned but it was still too late. The vessel’s jibboom ran between the braces of the arch and the headstays caught the bridge and swung it. The foreman ordered his partners to release the levers as it would be dangerous to hold onto them. Johnson, who was a powerful man, had the assistant lever and thought he could hold on. He couldn’t and was thrown with great violence against the braces of the arch. After the bridge had been violently forced open, the Captain yelled “You (d-) Dutchman! I will teach you to pay attention to my whistle!” The action was wickedly malicious, but the foreman couldn’t see why the Captain should have been guilty of it, as the foreman always was accomodating to the tugs and vessels. Johnson had a deep cut and was taken to the County Hospital. Capt. Connors was totally responsible for this even and there were several eye witnesses. At the time of the incident the wind and river current were favorable in stopping a vessel at any point desired and in a very few moments. At an early hour on the morning of 22 May 1881, Capt. Wilson and the crew of the tug Martin Green heard cries for help which appeared to come from some one drowning in the river near the foot of Dearborn street. A young man named Gorman promptly rushed to the rescue, and running over the bridge to the north side of the river, finally sighted a man paddling about in the middle of the channel.It was no easy task to rescue the man, but with the assistance of his comrades Gorman speedily managed it. The unfortunate bather was a young man perhaps 20 years, moderately well dressed, but evidently a laborer or sailor. He was thoroughly chilled, and could not have kept himself about much longer. In answer to questions, he said he had been attacked by two enemies on board some vessel near State street bridge, and to escape them had jumped into the river. The brandy which was given to revive him put him into a stupor so it was impossible to get his name or any further particulars. From what the tug’s crew have to say, there appears to be some mystery here. Gorman said he was positive there were two men in the water, as after he had saved the first, he distinctly heard the cries of the second, but as he was on the south side of the channel, he was unable to render him any assistance just then, and by the time he got around to the south bank, the cries had ceased. The police did not hear of the affair until some hours later. Oct 1882, engine to be removed & installed in new tug built at Saugatuck, MI for Captain Edward Van Dalson. It seems that the tug’s name was changed to Bob Reed on 27 March of 1884, but there is no official record of this change. May 1885, sold by Robert H. Reed to Bodenschatz & Earnshaw Stone Co.
On 22 November 1886, her machinery was taken out and was at the Chicago Drydock Company’s derrick where her wheel was removed. Her hull was sent to the bone yard and machinery will be placed in a tug that was being built by John Martel, probably the Annie D. (US No. 106436), which was built in Saugatuck, MI in 1886.